What is the Conspiracy of Venus, might you ask? The last chance to find out before the leaves turn will be Wednesday at their "season finale" with Garrett Pierce and Devotionals at The Rickshaw (8pm, $10). 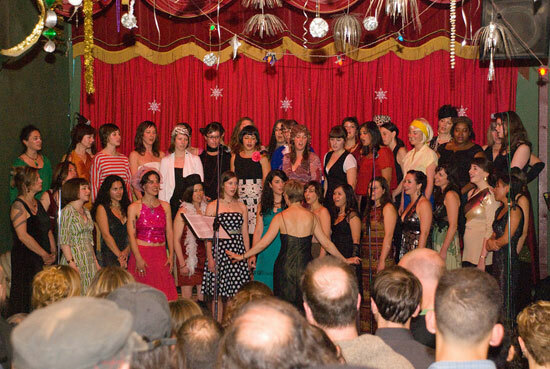 Director Joyce Todd McBride started the choir in January 2007, which sums to roughly 40-50 lovely female voices to date. Conceptually speaking, McBride describes the Conspiracy of Venus as "a symphony of sound unique to the pre-existing A Capella format, and so contemporary, you're humming it on the way out!" Known for their A Capella arrangements of timeless songwriters such as Tom Waits, BjÃ¶rk, Rufus Wainwright, and more to come, CoV's criteria for choosing songs to venerate imply musical curiosity. "We chose to sing music of more than one artist ... because we feel we can chart an adventurous course through the history of contemporary song-writing," McBride said. "Most importantly, the songs we choose must have depth of musical, textual, cultural meaning, and be a hell of a lot of fun to sing." Conspiracy of Venus - "I'm Your Man (Leonard Cohen)"
Imagine the small stages of Amnesia or the Makeout Room packed with rows of women belting four-part harmonies of Leonard Cohen's "I'm Your Man," or even soon enough, a new rendition of Joni Mitchell's "Black Crow." Upon returning to the stage with a roster update for the fall season, CoV will have added arrangements of Fiona Apple, David Bowie and Tower of Power, as well as some original material written by McBride to their repertoire. Conspiracy of Venus plays a role in the local music community that could hardly be dubbed unoriginal, by paying homage to respected musicians in a manner different than the local DJ's Smiths night. When seeing CoV this week at the Rickshaw one can expect the unexpected, but should take into account that this is not a band of out-of-towners, rather, the choir is deeply rooted in the local geography. We are truly a Bay Area community choir in that we are a diverse group ourselves and that we include community service in our mission," both McBride and choir president Miriam Jacobson explained. The women have sung at several benefits, including one for local artist and dancer Hollis Hawthorne, who fell into a coma in India and needed financial assistance flying home. Conspiracy of Venus - "Soldier Things (Tom Waits)"
The A Capella ensemble has connections to many Bay Area favorites including the Botticellis, Jen Grady (solo and supporting cellist of many local outfits) and Wednesday's co-supporters Devotionals -- the pair (Tyson Vogel of Two Gallants and Anton Patzner of Judgment Day) met Woletz during her days at UC Santa Cruz. "With the way everyone is connected, it begins to feel like one big musical family, with musicians collaborating and playing songs in each others' projects," Woletz said, "and it is beautiful to have the choir now be a part of that larger Bay Area music community." The list of local musicians CoV has supported is quite long: Emily Jane White, Pete Bernhard, Jesse DeNatale, Slow Motion Cowboys (side project of Trainwreck Riders), Cotillion (side project of the Botticellis), Kacey Johansing,Â Geographer,Â Two Gallants (at the Gulabi Gang benefit), the Mountain Goats (for Noise Pop), Evening Empire, David Dondero, and Mira Cook (a choir member), and Conspiracy of Beards, their all-male counterparts, who sing only Leonard Cohen. Woletz mentioned that this diversity of gigs is thanks to the joint effort of the choir's members. If taking part in an intricate layering of female voice sounds appealing, CoV will be holding their fall audition in August, and need an Alto 2 and Soprano 1! (Their annual spring audition is in February). They are a dues-based choir but also offer work-exchange, and require a substantial time commitment of their members. More information can be found on their website or Facebook page. thank you nicole & bay bridged!